The Yulara resort next the rock has accomodation for thousands of people. And they all have three targets: the rock, the rock and the rock again. So a large number of busses (tourists cannot walk) go for the sunrise view, so they all have the same sight. I am not sure it really looked impressive, as our group was too tired from the day before and the driver refused to go entirely for me. I can tell you it's nothing form the little hill next the resort. And if it's the same (nothing) from the official sunrise viewing point, we'll probably never know. Once people went to such a remote place, getting up around 4 a.m. in their holidays, it's bound to be great, no matter what it really is. Sunset can certainly be very scenic - just in case one has the right weather. We had clouds, so it wasn't that smashing. And the sight changes with wind draft and rain fall, as the apparent color is not the real one, not at all. 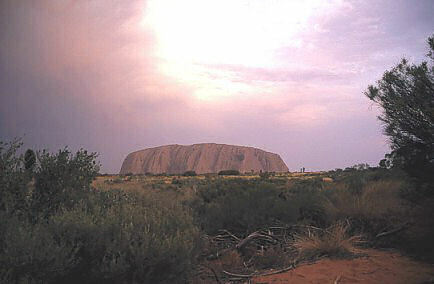 The rock itself is grey as any other sandstone. But it looks red as the red sand from the desert covers it more or less. So seen from close, it strongly reminded me to a very large ships wreck with rust all over. 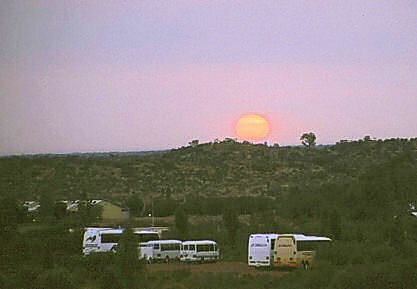 Anyway be aware all tour operators serve sparkling wine and snacks while watching the Uluru sunset. Call it disgusting, but have the wine, you paid it.